Flowman are proud to be authorised suppliers (and installers when required) of Astral deck level pool overflow grating. This is the Rolls Royce of grating ! It is constructed from robust materials to withstand damage and retains its good looks for longer than other cheaper makes. It comes in a choice of colours and can be contoured to fit pools with an unusual shape eg round spa pools and kidney shaped swimming pools. 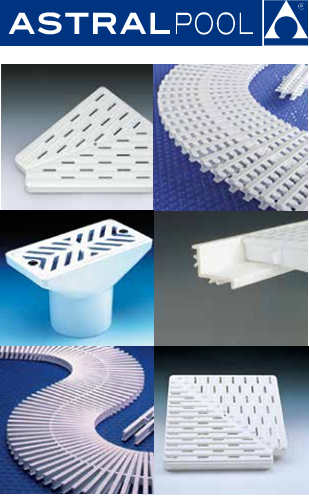 Astral also manufacture floor drainage channel grating, which is often found in changing areas etc. Made from the same materials, it provides the many benefits of good looks, long life and being easily cleaned, that are required in a busy sports centre. For advice or a site visit and samples phone Flowman. What we can also supply. . . In addition to the superb Astral range of products, we can fabricate bespoke channel grating, pool inlet and outlet grills and lots of other products from High Density Polyethylene (HDPE). This extremely durable material comes in many widths, thicknesses and colours. Contact us for further details. We can provide you with a helpful design guidance and costing quotation if required. Please see our Engineering section for more details or click Read More for a sample of our available stock.